Sharing thoughts, learning activities and resources as we preserve memories of our homeschooling days. Young children are often capable of recognising number symbols from 1 to 10 and reciting the numbers (one, two, three, four....) in the correct order. However, many of them do not yet grasp the concept of one-to-one correspondence. One-to-one correspondence is usually explained as the ability to match one object to one corresponding number or object. A child who does not understand one-to-one correspondence may skip counting an object when counting by rote memorisation, or count the same object twice or more. Preschoolers may take months or longer to master this foundational mathematical skill. Therefore it is important to provide young children with lots of opportunities to practise "one-to-one correspondence" in as many different contexts as possible. Below is a picture of a set-up that provides opportunity for practising one-to-one correspondence when counting. I folded a sticker label into half on one end of each pipe cleaner and labelled all of them from 1 to 10. You can use paper and glue too if you do not have sticker labels. I also prepared a bowl of beads to be used with the pipe cleaners. 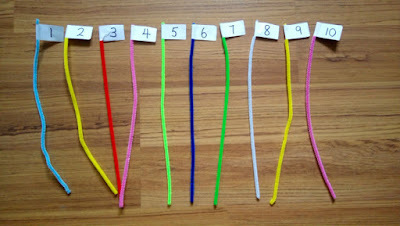 I asked David to tell me the numbers that were labelled on each pipe cleaner. He had no difficulty recognising them. I explained to him that if the number on the pipe cleaner is '2', he had to thread 2 beads onto the pipe cleaner; if the number is '5', he had to thread 5 beads. He caught on quickly and started to count the beads while threading. This counting activity is also great for practising fine motor skills and hand-eye coordination. 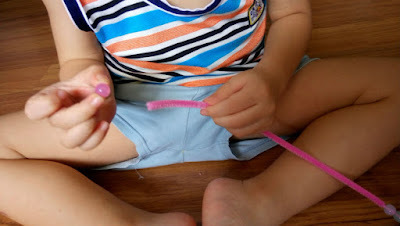 A steady hand and good coordination are both needed to pick up a small bead, find the hole in it, and insert the pipe cleaner through the hole. It may seem like a very simple task for us adults, but it really takes some practice for young children to do it well. 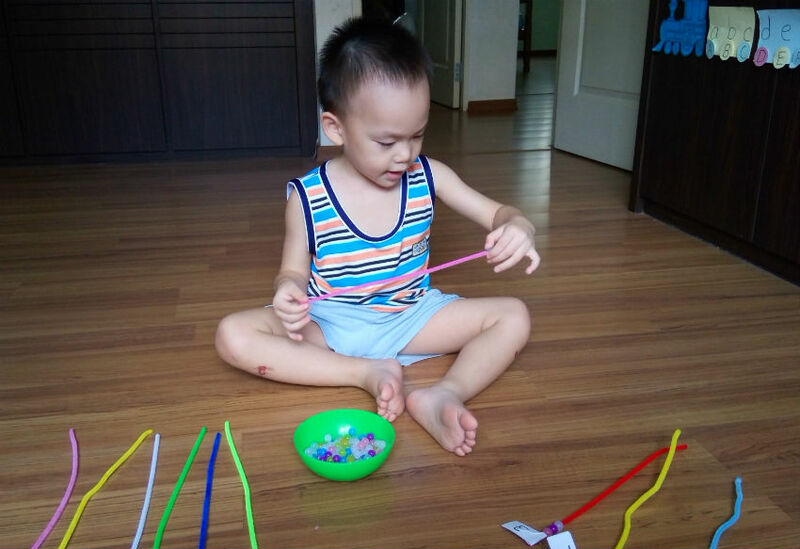 David had been exposed to threading activities before and now has no problems with threading beads of this size. Initially I was a bit concerned that David may not have the patience to thread all the pipe cleaners. He had to thread and count and check the number of beads for each pipe cleaner. Would he get frustrated or lose interest? In the past our threading activities were never this long and he did not have to deal with numbers and accuracy. I was prepared to let him stop if he showed any signs of frustration. After all, he only just turned 3 and only very recently learned to thread beads this small. My concerns were unfounded, for he apparently enjoyed the task and was able to stay focused. 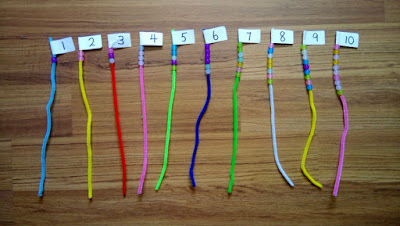 He would happily show me the completed pipe cleaner whenever he finished counting and threading for one number. I gave him lots of encouragement throughout the process and I believed that motivated him a lot! The picture above shows the fruit of his hard work. 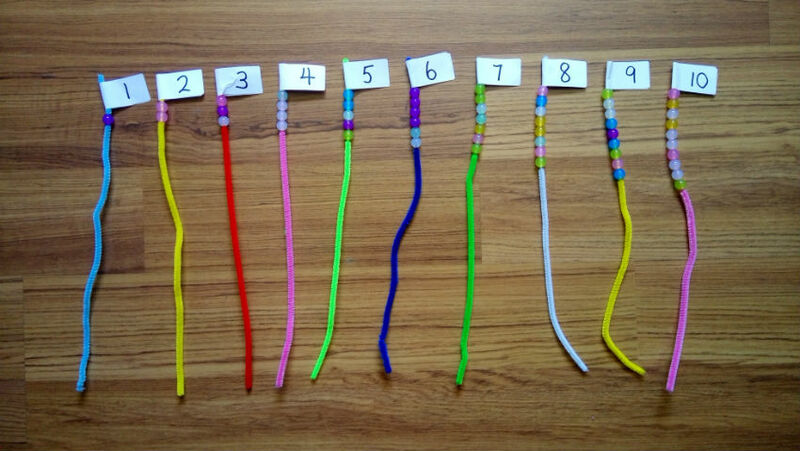 Each pipe cleaner has the correct number of beads on it. Well done, David!